Miss Milla Cherry: Peachy Keen! Pinup/rockabilly/vintage outfit posts and exciting adventures! 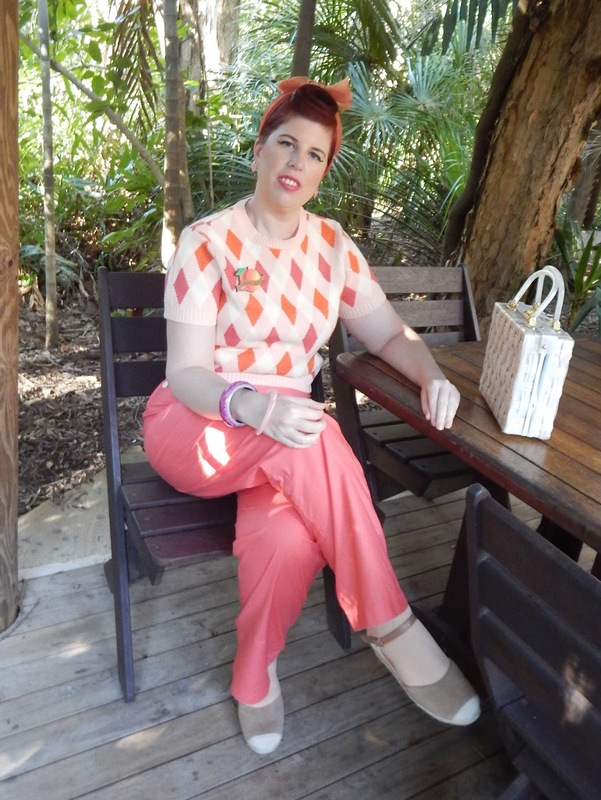 This wonderful jumper is from UK clothing inspired brand Miss Fortune which is called Bobbie Jumper - Peach Harlequin. 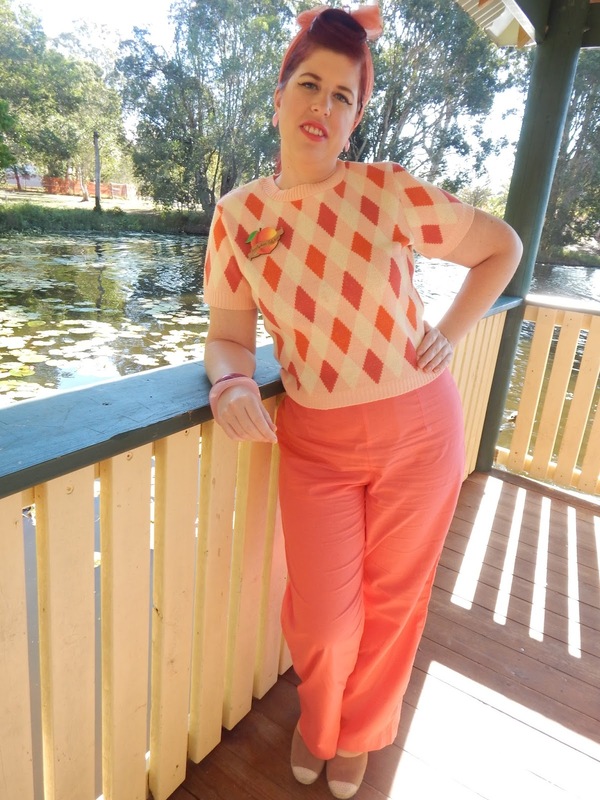 I love the harlequin print on this jumper (that's what attracted me the most) and also the Peach/orange/pink colours. These harlequin jumpers have many different colour variations to choose from, which you can purchase from Miss Fortune's website. These Bobbie Jumpers have short sleeves (which have some stretch and are not tight in the arms). They are cropped to high waist and are fitted. So would look good with high-waisted trousers/jeans, and pencil/swing skirts. I ordered size Large and it fits quite well on me and feels very comfortable to wear throughout the day. I would recommend wearing these Bobbie Jumpers on a day when it's not too cold, unless you wear it under a jacket or even a cardigan on a really cold winters day. These jumpers are made from 100% acrylic. I highly recommend on buying yourself one or even more of these gorgeous stylish jumpers! Anyway back to these trousers they are made from a light-weight cotton so hopefully will be okay to wear in summer, on colder days I'd wear stockings/tights underneath. There is a side zip and button to secure (plus small white faux buttons down one side). Only slight downside the cotton fabric crinkles really easily and these trousers are not as wide legged as I hoped. But still stylish and will look good matched with other tops/blouses/jumpers etc. These blog photos were taken by my Mum down at a lovely place in Hervey Bay, Queensland called Arkarra Tea Gardens, which is located on two acres of beautiful, landscape natural gardens. You can enjoy having breakfast, lunch, tea/coffee/drinks out in the beautiful, relaxing surroundings. Whilst my Mum, my sister and myself were enjoying lunch together we saw many bird wildlife, including Kookaburras here was one sitting above us. In other news over the weekend I enjoyed taking blog photos of two different outfits (this outfit being one), going out for lunch with Mum and my sister on Saturday, catching up on my washing and some ironing. I'm also eagerly waiting on some special parcels from Mr Postman to arrive, hopefully I get them soon! Apart from that just working etc. Note: All words & opinions in this blog post are written entirely on my own. Terrific outfit! You are so knocking it out of the ballpark on the pants/trousers front this year, sweet lady. Getting to Know Mid Century Sweetheart!